what I do the change on data.js file. A: Deluxe Tabs doesn't support API functions which can return theselected tab aslo. Q: Now I experiences a problem with the Danish letters in dhtml menue. I have changed the letters in the scriptfile - but this does not work. A: Please, check that you've set "Tools/Use utf8 encode". enter thissymbols and save data file in the way you save your html page. order to open your data file correctly in Deluxe Tuner. 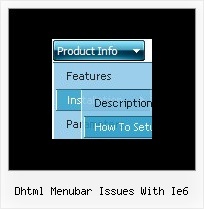 Q: I would like to know if I can use Deluxe Menu to create pulldown menus on a Mac (Mac OSX). Thank you. Q: We are testing your css drop down menu and everything is fine, except for the slow load in IE7. After the page is loaded, the first time we open each item it takes a lot of time to appear.